It was windy today. The gales whispered. A storm is coming. Temperatures will be in the fifties tomorrow. Rain in the valley. Possible snow in the mountains. SNOW!? We noticed the Fall colors this afternoon. Eliza and I. Seeping and intensifying on the eastern slopes. A cold snap this week will be sure to usher in Autumn glory. Although I welcome Autumn, I mourn Summer. I hardly knew she was here. I knew my boys. Their hands a-tangle with my flesh. Peach-fuzz heads under my chin. Tiny fists beating against my chest. I knew my girls as they jumped on my bed and brought me books to read. I knew “Inside.” Walls and windows. Filtered light. A Summer gone. With just a few flashes of Sun. A walk or two. Outings I can count on one hand. But our family and friends were generous. And thanks to them, the girls still had Summer. July meant swimming lessons for Eliza. Her first. We hopped out of the car and began our walk into the swim club. Eliza’s feet barely touched the sidewalk – she was so excited! She would be “swimming” with her friend Katherine (Kara’s little girl). Katherine and Eliza. Two best friends. I pulled a plastic chair pool-side and sat down to watch, to offer my motherly encouragement. To my horror, the first thing the teacher did was dunk Eliza completely under the water! Oh no! She’s going to hate this! It was a gentle dunk but the look in Eliza’s eyes when she turned to find me was now uncertain, afraid. My swim experience as a child was fretful. I dreaded swimming lessons. Two near-drowning incidents had me warped for years. I’m still a troubled swimmer. I wanted Eliza’s experience to be different. For her to feel comfortable in the water, confident. I smiled and nodded. It’s alright. Keep going. You’re doing great! She finished the first day like a champ. One more dunk under her belt. Day 2. Kara came to pick her up and she made excuses. She didn’t want to go. She wanted to stay home with me. I had to carry her to the car, kicking and screaming. Kara and I tag-teamed her into a seatbelt. Was I scarring her for life? Would she ever forgive me? Would she need therapy 10 years from now? It didn’t go well. Eliza refused to go in the water. And it was Kara who had to manage the conspicuous, dramatic nay-sayings. The next day I arranged for help with all four twins so I could go again. Maybe having Mom there would make it better. I made it worse. She clung to me like cellophane. 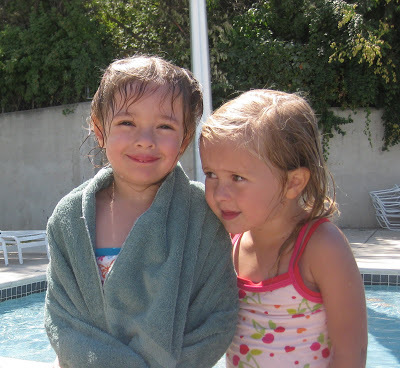 I wrenched her from my side at the end of class and bribed her to get into the water with her teacher. Just for a minute. She consented. Afterwards, the teacher politely asked me NOT to be there next time. He said experience proved she would do better without me. She would? Really? He would work with her, pushing her to go under the water. Again and again. She would probably cry the entire class but it would get better after that. I gulped. Again and again? And she would cry? Yes. She cried. Most of the class. Until he dunked her so many times, she put a lid on the howling. But he was right. The next day she did better. And the next day? Better. Each time Kara came to pick her up, however, I had to rally with her. Positive talk. A reward (Tinkerbell Dress from Target). Major encouragement. Eliza stalled and tried excuses. We had a few more wrestling matches into the car. But in the end she always went. Then she would return. Wet braids flying, accomplishments spilling from her lips like trophies glinting in the light. The last week of swim lessons, I arranged for help so I could join her once more. Bookend Mothering. Is it enough for stability? I wondered. Daddy showed up to watch her too. Legs splashing. Goggles donned. She beamed like the sun. She seemed in her element. Loving the water. Brandishing her new-found skill with eagerness and pride. We soaked her up. Every minute of her water show was priceless. The last day of swim lessons, Kara brought me a report. When they arrived for class, Katherine jumped right in. Eliza, however, stalled. She said she needed to put her shoes in “just the right place.” Then Katherine’s. She needed her goggles adjusted. Needed to use the restroom. Kara could sense some reservation but accommodated Eliza. She didn’t push her. Just watched her. Observing my little girl as she worked through whatever concern or fear she needed to suppress. Wise Kara. Finally, Eliza approached the edge of the pool, stood still for a moment and took a deep breath. Then she stepped into the water. Courage! She found it somewhere inside her! As Kara spoke, I realized what a challenge it had been for Eliza every day, to simply get in the water. Yet she did. And it got easier. But it was a battle she fought each time her feet hesitated by the pool steps. What a trooper! What a wonderful life-skill to acquire! The ability to do hard things. I had to write this one down. Because it won’t be the last time Eliza makes this choice. Do the hard thing? Conquer your fear? Or retreat? I want her to know at age 4 she found the courage within to do what was difficult. Mom learned a good lesson too. It’s okay to let your child do the hard thing, take the difficult path, feel scared, or even hurt. Swimmer girl. Strong-willed. Brave. Beautiful. Always do the hard thing Eliza. I love you. What a wonderful story! I'm sure it will give Eliza strength to re-read this story in years to come. Excellent! I'm so happy she likes the water now. Good on her teacher! My mom says I was "swimming" at nine months–my face would go down in the water and I would hold my breath and doggy paddle and kick a few feet toward her or the edge. I didn't fully believe her until I called to doublecheck. Alas, shortly thereafter she got pregnant with my next sister and I didn't go swimming for a couple of years. Had to start all over again. Kara is amazing. What a friend to help out that way. Cute little Eliza! Glad to see she is learning how to swim. Erin – I'm afraid we'll be starting all over again next year too! No surprise you were swimming early – you're always a step ahead of most of us! And Bec – I know. Kara is the true heroine in this story. Driving to pick Eliza up every day, managing the emotion of it all (and for Katherine too), then bringing Eliza home. Lessons were every day!! Phew! So lucky to have Kara.